On September 6 1839, an unusual notice appeared on page 2 of the Times. The notice placed by the Lords of the treasury, advertised a competition open to the general public in connection with the forthcoming introduction of the Uniform 1d post, detailed in Rowland Hill’s famous pamphlet of 1837. The notice listed all the requirements needed and offered prizes to the most promising suggestions. The response to this notice was quite staggering and Hill wrote in his diary for September 21st "Thirty letters a day are now received at the treasury". By October 15th, the closing date, well in excess of 2600 communications had been received, including a good number from the continent. Pearson Hill, Rowland Hill's son, stated at the time that there were only 49 individuals who sent in suggestions or designs for stamps and only 19 of these could be selected as being of merit. By December 2nd, the Treasury Board had selected four ideas and the inventors were awarded £100 each. Messrs James Bogardus and Francis Coffin, who sent in a joint proposal, shared £100. Their essay however has regrettably been lost. Benjamin Chevarton, picked up £100 for his idea which was to produce long rolls of stamps that might be separated before use. These ‘labels’ would be embossed. Third was Sir Henry Cole, again awarded £100 for his 'embossed device'. Cole became an assistant to Rowland Hill at the Treasury a year later. Lastly Charles Whiting, awarded £100 for his submission of over 100 various essays, a number of which today are among the best known. However Rowland Hill decided that none of these really matched all the requirements he had in mind. Many were ingenious but Hill was still not completely happy and by December 11th, he had obtained authority from the Chancellor of the Exchequer to begin preparations for the worlds first postage stamp. The final design of which he alone had devised. A large proportion of these Treasury competition entries have survived to this day. A wide and indeed almost complete selection may be seen at the National Postal Museum in London. There are still plenty of examples to be had in the open market, if you are able to afford them! Most collectors and indeed dealers, fail to appreciate just how important and rare these first essays for adhesive postage stamps and stationary really are. These early designs show quite amazing varieties. Some are very simple whilst others are extremely elaborate and many quite impractical. 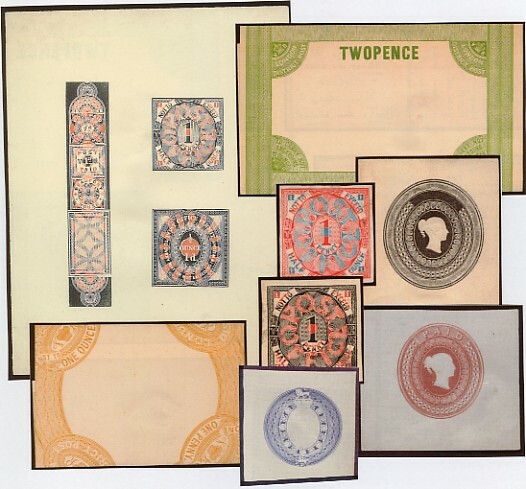 The competition if nothing else proves to everyone, beyond a shadow of a doubt, that the Victorians were eager to present what is now generally regarded as some of the most collectable philatelic items available.